Do you want to learn English as a Second Language? Whether you speak no English at all, or if you know a little or a lot of English, we have classes for you! 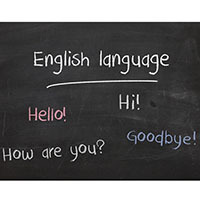 Santa Fe Community College will offer English as a Second Language courses to any adult who wants to learn English. New students must attend an orientation session prior to registration. The orientation session will include testing and placement as well as registration for the courses. The registration fee of $25 can be applied to more than one course and includes all class materials. The classes will be offered at Santa Fe Community College (levels 1-6), El Camino Real Academy (levels 1-3) and Nino Otero Community School (levels 1-3). Morning and evening classes will be available at SFCC; evening classes are offered at El Camino Real Academy and Nino Otero Community School. Students may attend any of the three-hour orientation sessions. Free childcare (ages 4-12) is available during class time at El Camino Real Academy and Nina Otero Community School. Orientation and Registration sessions will all take place at the Santa Fe Community College, Adult Education Department, 6401 Richards Ave. Please arrive early, no entry into the orientations will be allowed if attendee arrives 15 minutes or more after the respective start times. Wednesday, January 16, 10 a.m. to 1 p.m. or 5:30 to 8:30 p.m.
Thursday, January 17, 10 a.m. to 1 p.m.
Wednesday, January 23, 5:30 to 8:30 p.m.
Thursday, January 24, 10 a.m. to 1 p.m. or 5:30 to 8:30 p.m. Classes begin January 28, 29, February 4 or 5, depending on the location. Space is limited. For more information, call 505-428-1356.